Visa Inc. is an American multinational financial services corporation headquartered in Foster City, California, United States. Save on trips to the ATM and leave your checkbook at home. You can choose to sign for purchases or use a PIN. The choice is yours. Visa monitors your account 24 hours a day to help prevent, detect and resolve fraud on your Visa Debit card. Better money management – Your Visa Debit transactions are automatically deducted from your bank account so you can access your up-to-date balance on your issuers' website or by phone. Your bank statement provides full details of your purchases, including merchant name, location, date, and amount. MasterCard is one of the leading company providing funding solutions across the globe. Moreover, it offers a large and worldwide payment solution as well as MasterCard World Experiences and Offers, which is a partnership with several popular brands and companies. MasterCard Offers card-specific bonus spending categories.Because World MasterCards are among the most premium card offerings from issuers, many of them often come with some great card-specific perks. Maestro (stylized as maestro) is a multi-national debit card service owned by Mastercard that was founded in 1992. Maestro cards are obtained from associate banks and can be linked to the card holder's current account, or they can be prepaid cards. RuPay is an Indian domestic card scheme conceived and launched by the National Payments Corporation of India. It was created to fulfill the Reserve Bank of India’s desire to have a domestic, open loop, and multilateral system of payments in India. You can access RuPay in 1.45 lakh ATMs and 8.75 lakh POS terminals across India only. It will also be accepted on 10,000 e-commerce websites. Maestro is accepted at 12 million points of sale. Visa, as of 2009, is accepted at 30 million merchants in 170 countries. MasterCard is accepted at 28 million merchants in 210 countries. MasterCard has better worldwide acceptance than Visa, but Visa has better acceptance in the USA. Visa is the more widely accepted card than Maestro and Visa has a more foreign reach than Maestro. Maestro has a more foreign reach than RuPay(Since it's an India only brand). 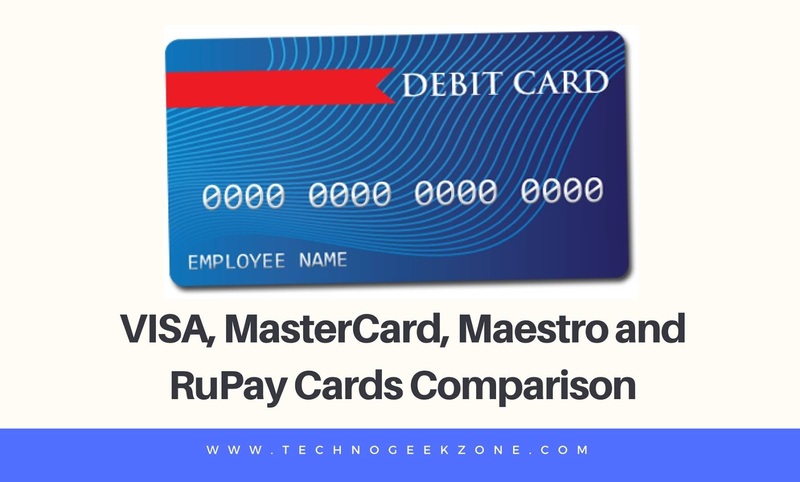 VISA card provides much better protection than Maestro card since it doesn't come with a chargeback which provides a better payment protection of the customer ensuring them a safe and hassle free purchase. RuPay is currently restricted to Indian economy business and transactions across thousand of websites or ATM in the country. RuPay is an initiative of JAN DHAN YOJNA by Prime Minister of India Mr. Narendra Modi, in order to promote Make in India.